LAMONT PETERSON: "KHAN MADE A MISTAKE...THERE WILL BE A NEW WORLD CHAMPION"
"We working hard, we got a good strategy going on, and I feel good going into this fight. We gonna go in there and do our thing on December 10th...It's going to be nice to see some familiar faces in the crowd for once. I haven't fought here in 4 or 5 years, so it gives me that extra boost to defend my house. It just makes me train that much harder. I think Khan made a mistake by agreeing to come here...He probably has the quickness and speed of Timothy and the height of Cayo because he's kind of lanky. I think those fights that I had before will help me prepare for Khan and I think I'm fighting him at the perfect time...Just stay tuned on December 10th. There will be a new world champion," stated top jr. welterweight contender Lamont Peterson, who talked about his upcoming December 10 showdown with unified jr. welterweight champion Amir Khan. Check out what else he had to say! PC: How is everything going my man? LP: Everything is going great in camp, man. We working hard, we got a good strategy going on, and I feel good going into this fight. We gonna go in there and do our thing on December 10th. PC: Most of Amir Khan's opponents have had to travel to the UK to fight him. It has to be a big plus for you to fight him in your hometown of Washington D.C.
LP: It's a big plus. It's going to be nice to see some familiar faces in the crowd for once. I haven't fought here in 4 or 5 years, so it gives me that extra boost to defend my house. It just makes me train that much harder. I think Khan made a mistake by agreeing to come here. PC: Khan has been hot of late, but I'm sure you see flaws in him that you can exploit. You don't have to reveal them, but do you see some? LP: Oh yeah! Every fighter has flaws, but at the same time, I try to focus on his strengths and take them away. That's the way I like to break fights down. I like to figure out what he does best and from that point, figure out what he is going to take away and go from there. PC: You put in some good body work early against Victor Cayo and were able to stop him in the 12th round. In my opinion, that showed your power holds up even late in fights, which is a testament to your conditioning. How do you think that helps against Khan? LP: Yeah, we train very hard in the gym to last 12 rounds. We train like we are going 15 rounds for every fight. My power does carry through the whole 12 rounds and sometimes I feel stronger as the fight goes on. i think that will be key against Khan because he comes out fast, but he kind of slows down as the fight goeS, and if he does, we will jump on him at that point. PC: I think one thing that will help you out as well is the fact that you have been in there with Timothy Bradley, Victor Cayo and Victor Ortiz. The experience you gained in those fights have to be another huge plus in your favor. LP: Yeah, the different styles of those guys helps for sure. He probably has the quickness and speed of Timothy and the height of Cayo because he's kind of lanky. I think those fights that I had before will help me prepare for Khan and I think I'm fighting him at the perfect time. PC: How do you not let this become a pressure fight for you? Like you said, this is your first time fighting at home in about 5 years. I'm sure people are hitting you up for tickets and things like that. How do you not let that get to you in some form? LP: I just turn my phone off and everybody that asks for tickets...I don't have any. Just the whole hype, it's a big fight and it being in my hometown and all of that, I just feel much more comfortable in these big fights. I have been here before. Each time you get to this stage, you feel better and more confident and you just feel at home. So right now, I just feel that I have had enough big fights just to feel comfortable and be at ease and not worry about all of the pressure. I know at the end of the day, it's just a fight and I will treat it that way. I have been doing this my whole life. I'm not gonna let the moment be too big for me or anything like that. I'm just going to go in there and do what I do. PC: You have remained calm under duress, such as the knockdowns you suffered against Bradley and against Ortiz. I think this fight will be a firefight as well and I think it will be very important for you to remain calm. LP: Yeah, it will be a firefight and being calm will be key because if any one of us gets overconfident or not manage our edge right, or get caught up in the hype and just go out there swinging...if he does that and gets tired, it's going to be a problem. I know with me, if the tempo is high, then I'll fight it. I also will be cool because I know that will help me because I know that I won't burn out at the end. PC: You and your brother are accustomed to fighting on the same card. I know you guys always did it on the Mississippi circuit. Do you guys train together as well? How do you handle being on the same card? LP: We train together every day at the gym or whatever. Whatever he do, I do and whatever I do, he do. We haven't fought on the same card in a long time and it's like they say in any fight, you never know what's going to happen. If I sit there and worry about my brother and what he is going to do, it kind of takes away from your fight. For this fight, we both know what we have to do. I have confidence in him that he will take care of business and I will come right behind him and do the same. PC: This is a big fight on the big stage, as you mentioned. 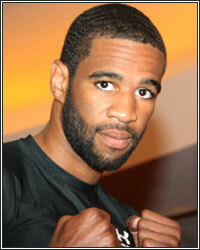 What kind of statement are you looking to make and what can fans, who may have never seen Lamont Peterson fight before, expect? LP: They can expect me to fight hard. I'm always going to fight hard, but expect me to also fight smart. They can expect a good fight. I know Khan will show up at his best and I will do the same. I just want to make the statement that I am the best 140-pounder out there and I want to be considered one of the top pound-for-pound fighters out there. I'm always looking for a challenge. I just want to make the statement that I'm here and I'm willing to fight anyone. I'm not ducking anyone. I'm not picking fights and trying to win easy titles or anything like that. Any time I have fought on this stage, it's never been an older fighter, never been a fighter that is kind of washed up or not on my level or handpicked fights. I fight the guys that they put in front of me. I fight the guys that...I worked my way through the rankings and he is #1 for that belt at the time; that's the person I'm fighting. I'm not trying to jump fights or go down in ranks and fight somebody for an easy title or something like that. I pride myself on that. I never look for easy fights and I look forward to the challenge on December 10th. I want to make that statement when we do get in the ring. PC: Is the goal a knockout? Any prediction for the fight? LP: A win is a win, but if I can knock him out, that's the best way to do it; not leaving it in the hands of the judges, referees or anyone else. A knockout is best and if I get any opportunity to do so, I will definitely go for it and go for it hard. I will be sending shots that can knock him out, but I will take the win as it comes. That's just part of boxing. If it's a hard-fought 12 rounds or an easy-fought 12 rounds, it's whatever. PC: Best of luck to you, man. I look forward to the fight and speaking to you leading up to the fight and afterwards. Is there anything else you want to say in closing? LP: Thanks man. Just stay tuned on December 10th. There will be a new world champion.